This past weekend was the inaugural BSides conference located in Orlando, Florida. Around 200 security professionals gathered to hear talks, partake in a capture the flag, and pick some locks at the lockpick village. I give a major hat tip to the events organizers. They made sure everything was in order for an awesome event. For it being Orlando's first BSides it went extremely smooth. The presentations ranged from web application hacking to grabbing credentials from RFID devices to emulating a Super Nintendo with a Raspberry Pi. Sadly, there were times when two talks were going on at the same time and I would have liked to have seen both. I believe they did video some of the talks though. I will link them here once they post them. I ran into the same problem of not having time to sit in on the CTF as it was going on during the presentations. Last but not least... The badges... Wow. They hooked everyone up these amazing Arduino-based boards. The board includes the same Atmel ATmega328P microprocessor that is on the Arduino Uno. A Nokia 5110 LCD was added to the board to display bitmap images. 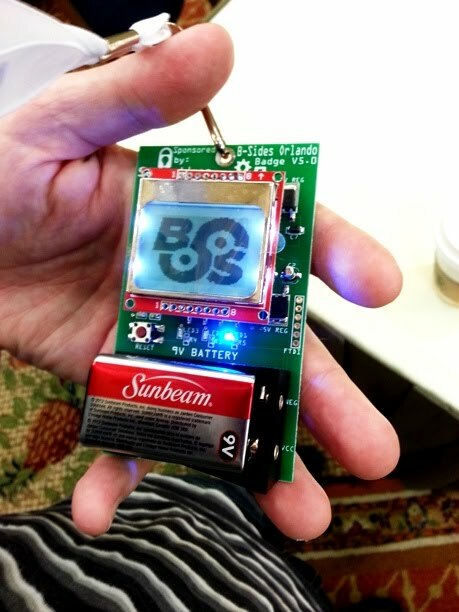 With the included 9v battery they supplied the device powers up and displays the BSides logo. They have supplied the source code so attendees can take them home and modify the image displayed. After attending the "Badge Hacking Workshop" I learned that these devices can be used for a lot more than just displaying images. Having never touched an Arduino device I am now extremely interested in learning more about them. Perhaps in the near future I will have another post on something interesting I have done with it. Thanks BSides Orlando for a great weekend and I can't wait until next year!